WOOSTER, Ohio — A cold brew starts with some of the finest ingredients. One of those ingredients used to be prominently grown right here in Ohio and now local producers want to see it make a comeback. “I’m going to grow crops that make beer. 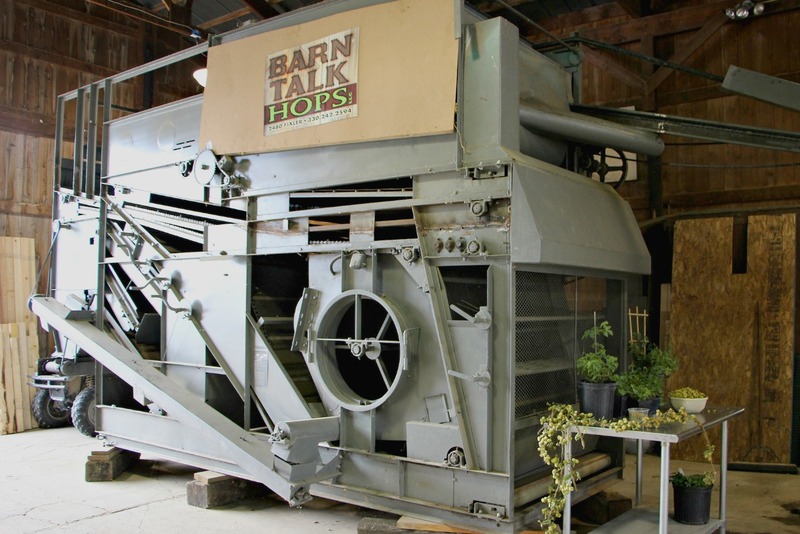 That’s pretty cool,” said Mike Napier, owner of Barn Talk Hops in Sharon Center, Ohio. He hadn’t put much thought into his retirement plans, but he was inspired by an article he read in Farm and Dairy about Ohio State’s efforts to bring a once-popular specialty crop back to the state. Mike and Jenny attended the first conference on hops at Ohio State’s Ohio Agricultural Research and Development Center to learn more, and before they knew it, they were installing an acre and a half hop yard. For Andy Pax, of Heartland Hops in Fort Recovery, Ohio, getting started in the hops industry “was all kind of coincidence.” Pax was helping a friend who lived out of state, manage his farm back in Ohio. One evening, Pax watched a television special about hops being grown in the area before diseases and prohibition drove them out of the state. He was intrigued. The very next day, Pax’s friend called and told him, “I want to do something different with my farm.” Pax suggested trying hops. Now after his eighth season, Pax has just a little under an acre of 1,000 hop plants in six different varieties. With a boom in the craft brewing industry in the state, many growers are finding their niche and trying to fill the void for a locally grown product. According to Ohio State Extension research, Ohio beer manufacturers send an estimated $30 million in hops purchases and related jobs out of Ohio. 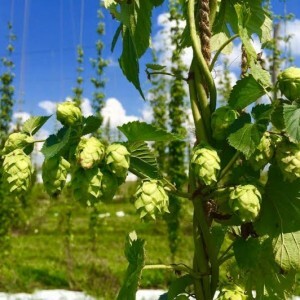 “We need about 6,000 acres of hops to supply the current usage of hops by Ohio craft brewers,” said Brad Bergefurd, Ohio State Extension horticulture specialist. Right now, Bergefurd estimates Ohio has around 200 planted acres, but only 100 of those acres are in production. The Napiers spent a lot of time researching hops. Owning her own landscaping businesses, Jenny already had a good understanding of plant biology. She propagates all the plants for their hop yard and grows 13 varieties. During their research, Mike and Jenny attended a brewing class to get a better understanding of the processes and what brewers want. “You just don’t jump on a tractor and farm hops. There is a lot of manual labor that goes into it,” said Mike. Mike and Jenny put in 112, 20-foot poles in their hop yard to build the trellis support system. After the trellis is established, it’s time to plant the plants. Once the shoots start coming up, the initial bull shoots must be removed so the stronger shoots can grow, explained Mike. These shoots must be trained to climb the trellis. “Our family said we were crazy,” said Jenny, especially after purchasing a Wolf harvester machine before even putting a plant in the ground. But the Napiers knew that it would be well worth the investment. The Wolf WHE 170 Hopfenpflückmaschine, or more simply known as the Wolf picker (or harvester), is a stationary machine that stands around 12 feet high. Hop binds are picked by hand and then fed through the machine to separate the hops from the bind. 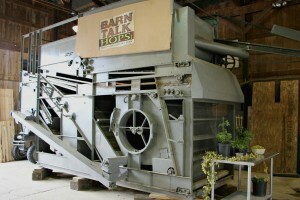 With the machine, it took two hours to harvest 400 plants said Jenny. In comparison, another hop yard they know, took four hours to harvest 50 plants by hand. 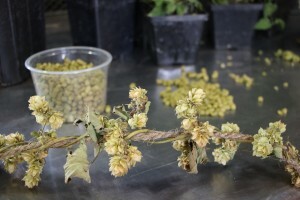 Fresh off the bind (often referred to as green hops), hop cones have an 80 percent moisture content. They must be dried down to 8-10 percent. Mike built a large wood box with fans and vents to store the hops in as they dried. “The humidity expanded the drying time by eight to 10 hours,” putting the drying process at 20-30 hours all together, Mike explained. The next step is to keep the hops cool — stored between 32-36 degrees — until they are ready to be run through a pellet mill. The pellets are what the brewers want. Jenny said, there are two main seasons in hop farming — training the plants to climb the trellis in the springtime, and harvesting the hops. Throughout the season, it’s a matter of maintaining and checking plants to make sure they have proper nutrients. Getting started in hops growing can vary from farm to farm, but with the purchase of equipment to build the trellis, producers can expect to spend anywhere from $20,000 to $25,000 an acre. “It’s not a get-rich-quick plan, but it is sustainable,” said Mike. The Napiers predict they have about a three-year return on their investment — which includes their purchase of the Wolf harvester and pellet mill. Pax, who works construction for a living, was able to offset much of his startup expenses by using materials he already had from his current job. 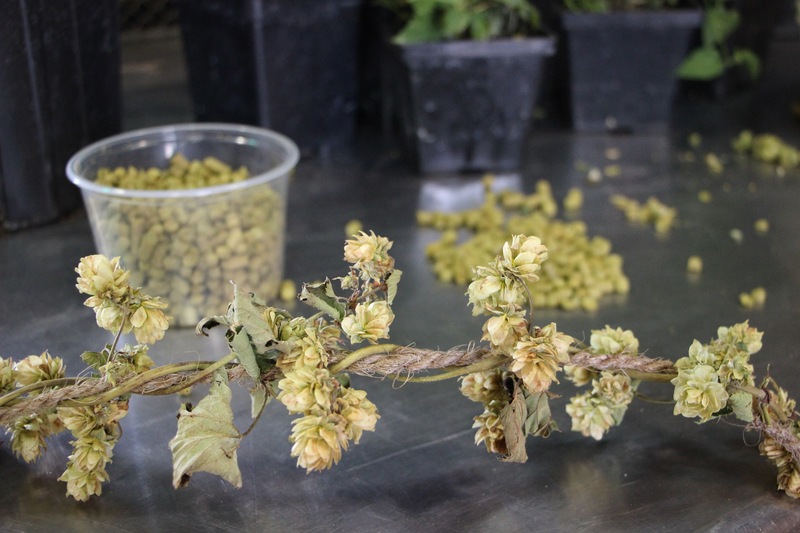 Heavy rainfalls earlier this year posed some challenges for Ohio hop growers. “I would say it increased yields, but caused heavier disease pressure,” said Bergefurd. Producers also faced downy mildew and infestations of Japanese beetles and spider mites. “June was tough. The rainfall made spraying for pests a challenges,” said Mike, who battled a small infestation of Japanese beetles. The Napiers also noticed the leaves of their hop plants yellowing due to nitrogen deficiency. In western Ohio, Pax also struggled with heavy rainfall, which brought on some downy mildew and made it hard to spray for pests. In contrast, July and August were very dry, increasing the need for irrigation. “We were running 1,500 gallons of water every other day” to the hop yard, said Mike Napier. But overall, producers say their yields were not largely affected. The Napiers reported a harvest of 1,600 pounds of green (wet hops fresh of the bind), which amounted to 500 pounds of dried hops. They hope to double their yield next year — around 3,000 pounds of green hops — with a more matured second-year plant. Pax harvested around 200 pounds of dried hops this year and said he is “sold out.” Working with two local brewers, Pax had marketed his pellets a year in advance. Taking a look at the state, Bergefurd shared high yields for the 2015 season of 4,000 pounds of green hops or about 800 pounds of dried hops per acre. While he’s excited to see the industry growing in Ohio, Pax expects many early “enthusiasts” to phase out quickly, if they are not serious enough to handle the costs, both financially and physically. 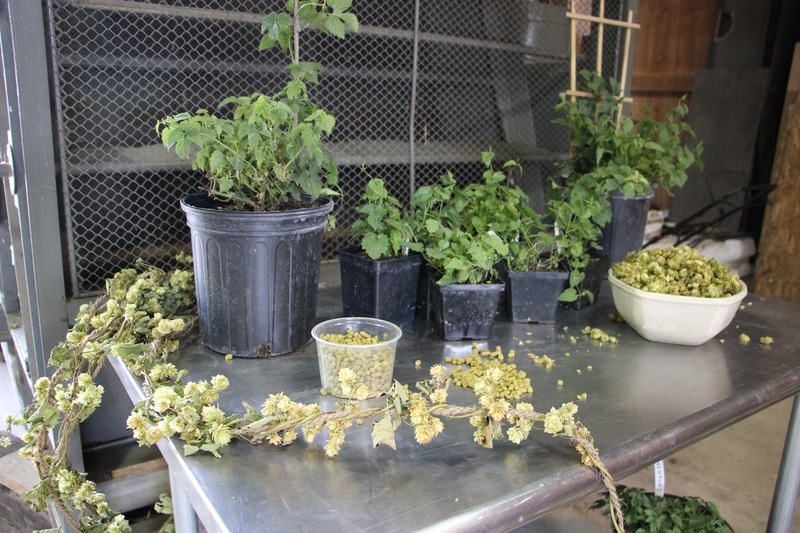 “As the industry matures, I think we will see a lot more established hops yards,” he said. And there has been a lot of interest from serious producers hoping to learn more from each other. The Ohio Hop Growers Guild was established by Ohio hops producers to create a network and connect producers across the state. 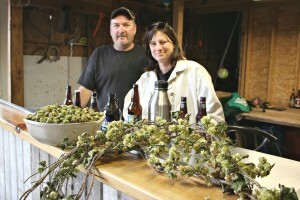 Mike and Jenny Napier helped get the Ohio Hop Growers Guild established. Jenny heads the education committee for the guild. The guild was also established to help growers market their hops and ensure a sustainable hops industry in the state. By encouraging quality from their growers, producers hope that brewers will see value in purchasing hops from guild members. “One of the greatest things about the industry is the people. Everyone is pretty open and free about sharing (about their operations),” said Pax.